With Fresher Week just past, it seems fitting that this post should be based around diplomas – even if graduating does seem a long way off for these new students! 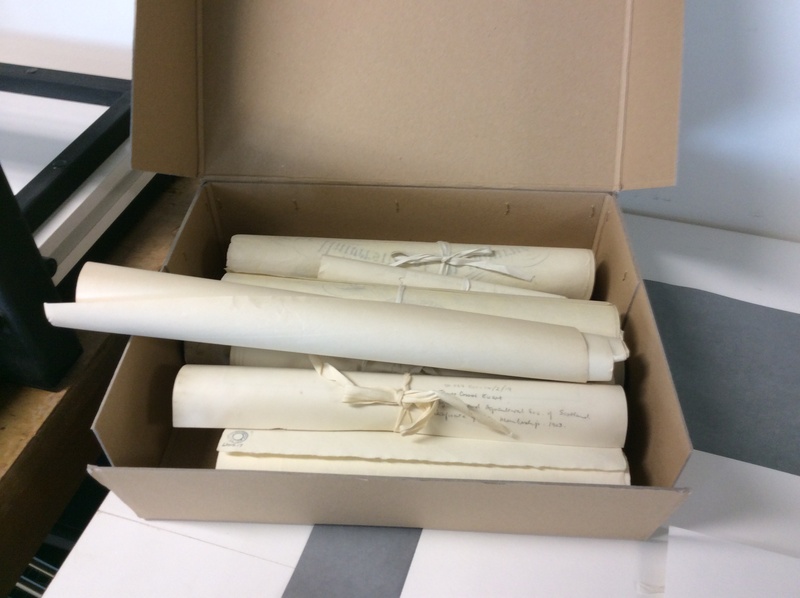 Archival Box containing rolled diplomas from ‘Toward Dolly’ Project. 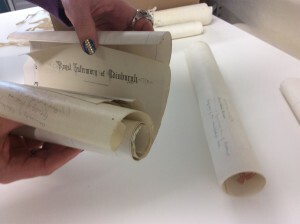 Several months ago, I was presented with an interesting conservation challenge by ‘Towards Dolly’ Project Archivist, Clare Button, namely a box of tightly rolled diplomas and certificates. As Clare explains these are “certificates for many of Edinburgh’s leading biological scientists, giving an insight into their training, education and society memberships”. There are medical degree certificates for James Cossar Ewart who became Professor of Natural History at the University of Edinburgh in 1882, and who established the teaching of genetics in Edinburgh. There are also Alan William Greenwood’s undergraduate and doctoral certificates in Science from the University of Melbourne. Greenwood emigrated to Edinburgh in 1923 to study poultry genetics and he later became Director of the Poultry Research Centre. Finally, the honorary degree and association membership certificates for Charlotte Auerbach, a pioneering mutation researcher at the Institute of Animal Genetics, show the respect she garnered from colleagues and institutions around the world. 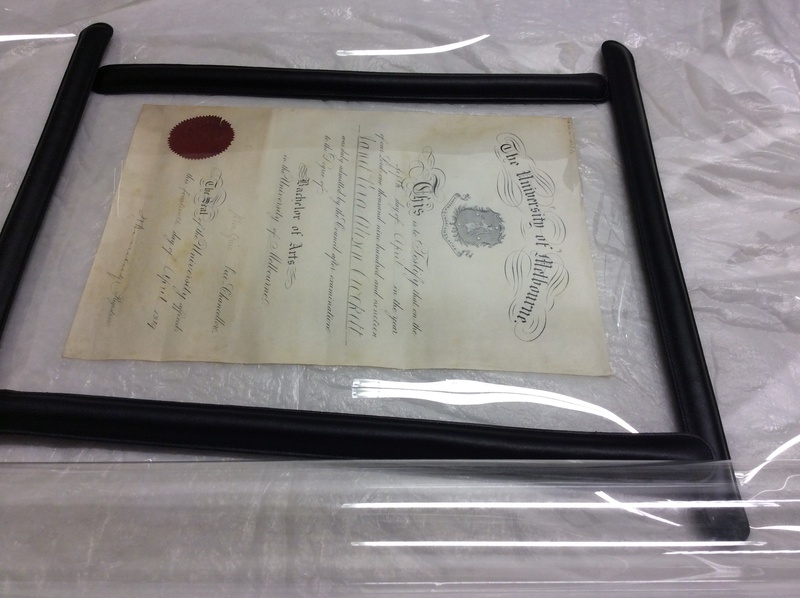 The diplomas and certificates in their existing rolled format proved to be very difficult to handle and view, even with the aid of weights. This was particularly problematic in those rolls consisting of multiple documents, with anything up to eleven sheets – and undoubtedly it is always the one in the centre that is required! It was therefore deemed appropriate to unroll and flatten them in order to improve handling and enable them to be more accessible to potential readers. On examining the documents, it soon became apparent that dry pressing the sheets would not be sufficient to flatten them satisfactorily. 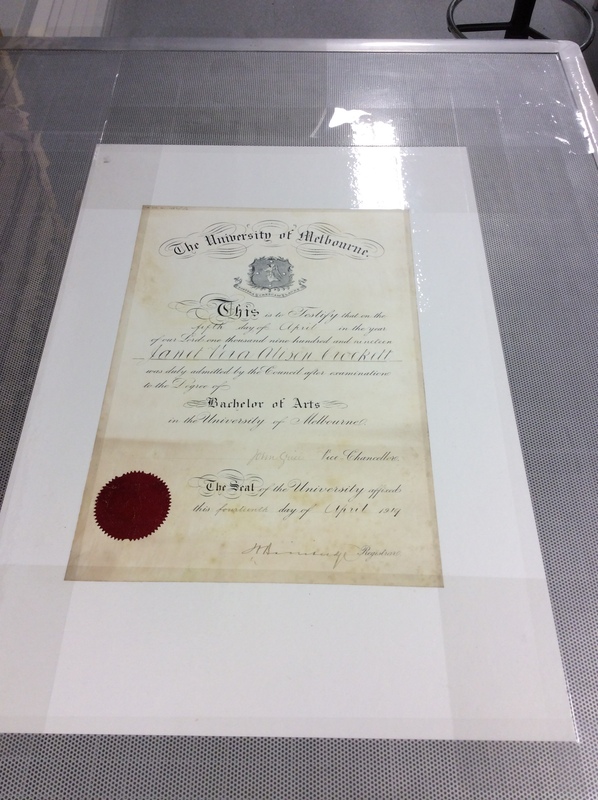 Prior to any pressing, the sheets would first need to be ‘relaxed’ through humidification – a method by which moisture is slowly and carefully introduced to the document in a controlled environment, relaxing the paper and slowly flattening the sheet. I humidified the objects by laying each document upon a layer of Gore-tex® which, in turn, is place on a sheet of non-woven fabric which has been wetted. The Gore-tex® acts as an interleaving layer and, due to its micro-porous nature, gently introduces moisture to the object above. Finally, a layer of transparent Polyester is placed above this set-up and, with the aid of weights, a make-shift chamber is created to maintain a humid environment. This method ensures moisture is kept to minimum, thereby lowering the risk of distortion or disrupting potential water soluble inks. A very close eye was kept on the documents during this process all the same…. When the paper was suitably relaxed and unrolled, the diplomas were placed on a low pressure table which uses suction to remove excess moisture whilst gently restraining and manipulating the sheet to lay flat during this drying process. This is a quick (but very noisy) method, which was subsequently followed up with a period under weight in the press. Whilst pressing, extra care had to be taken with those diplomas with embossed stamps or paper seals. 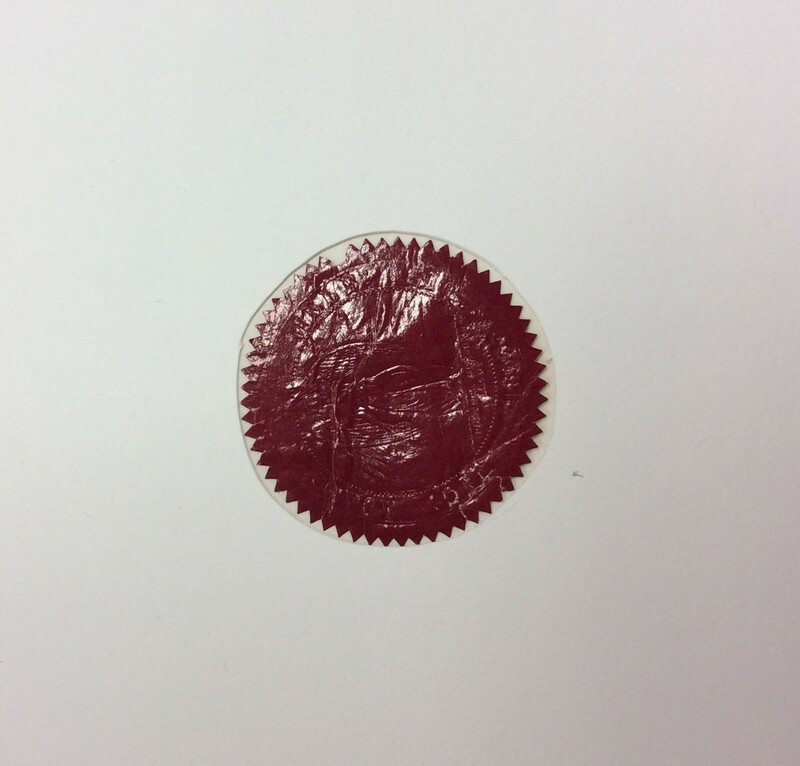 Tracings were taken of the seals, the shape of which was cut out of the blotting paper used to sandwich the object during pressing. This ensured the rest of the sheet remained flat, whilst avoiding the stamps and seals in order to retain their raised design. 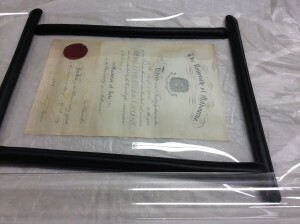 The sheets were pressed for several months to ensure that the diplomas did not retain their ‘memory’ of their previous existence as a rolled document. Once pressed, the final step was to place the diplomas and certificates into transparent Polyester sleeves, allowing them to be housed safely and, most importantly, flat in acid-free archival boxes. As Clare adds about the ‘Towards Dolly’ project, “these collections are not only an invaluable resource for research on the history of science and medicine, but they also speak to all of us by revealing the fascinating human story behind the science”. Definitely something to remember when walking up to collect your graduation certificates….